Twins Gavriel and Amitai recently turned 12. This year their mum asked me to make a tennis themed birthday card for Amitai and a swimming one for Gavriel. 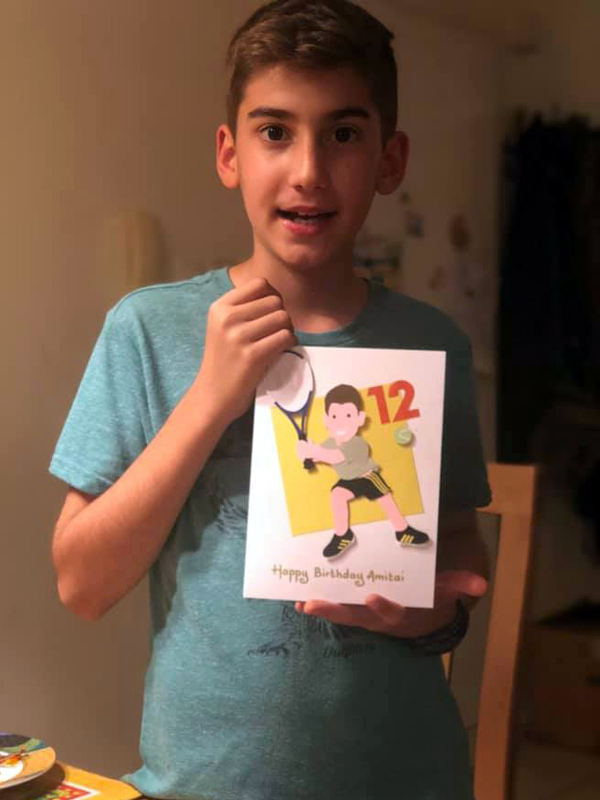 I make cards to mark their birthday every year and have in fact made cards along those themes before (I did a tennis card for Amitai when he was 9 and a swimming one for Gavriel when he was 10). My task was to come up with something different! I quizzed mum about what her boys wear for their various sporting activities. Gavriel wears black swimming shorts and swimming goggles with clear lenses and red straps, she told me. I have shown him happily swimming across his card. I popped the goggles on to the top of his head so that we could see his face. I made sure to make the background red, his favourite colour. He is also very into reading Percy Jackson books in Hebrew, mum was excited to add, so I included some Percy Jackson book covers on the card as well. Tennis player Amitai wears black adidas shorts and a grey Dri-FIT t-shirt for his preferred sport. His tennis racket is blue and white and has a red W for Wilson on the strings. His favourite colour is yellow, so I made that the background colour of his card. 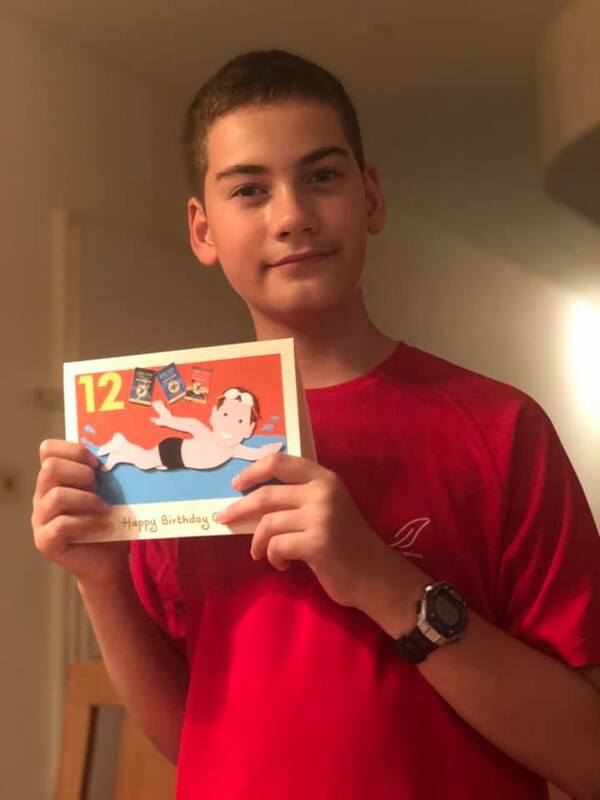 Mum shared these fabulous photos of the boys with their birthday cards and said that they were very happy with them. In the meantime, you should have seen the cakes she made for their big day. They are very lucky young men! 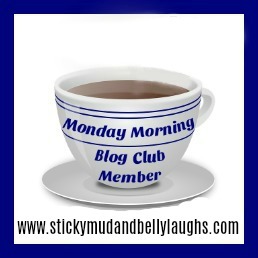 * This post has been shared on Amaze Me Monday, Inspiration Monday, Mix it up Monday, Creative Mondays, The Good. The Random. 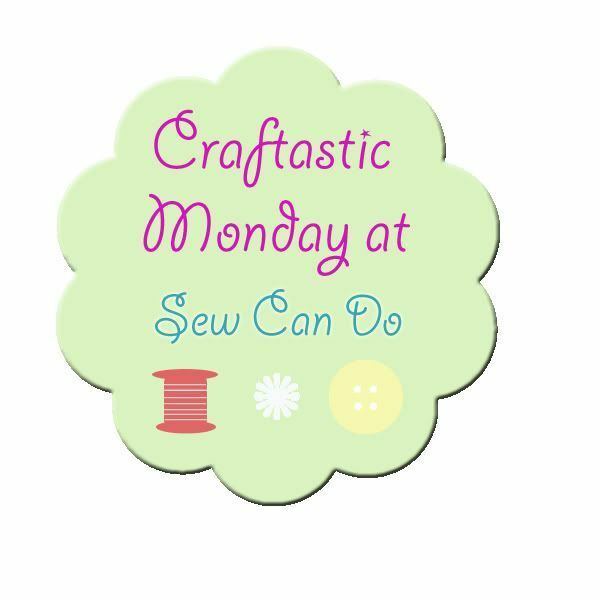 The Fun., Made By You Monday, Inspire Me Monday, Happiness is Homemade, Busy Monday, Inspire Me Tuesday and Creatively Crafty. 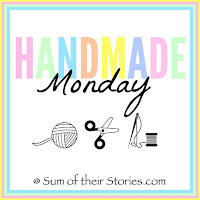 I love handmade cards, too, and they have always been a big hit when I make them for my grandchildren. Yours are wonderful and so personal. 2 more brilliant cards, your attention to detail is once again amazing! Well done! I love that the boys posed with your cards! Outstanding examples of your art! It’s neat that the twins have different interests....love the way your cards celebrate that! Fantastic cards again! You're a talented lady.